The Public Poems: a street libido. Digital prints and videos of The Vietnam Public Poem (1967), The Punctuation Public Poem (1972) and The Teutonic Public Poem (1991). Curated by Fondazione Bonotto. Alain Arias-Misson, The Punctuation Public Poem. Pamplona (1972). Courtesy of Fondazione Bonotto. Born in Brussels in 1936, Arias-Misson was four years old when his family left Europe for New York; returning to Belgium after the war at the age of thirteen where he studied for three years, a period which imbued him with classic culture. The rest of his education was in the United States in New England, graduating from Harvard U. in Greek and French literature. He left for Algeria, where he taught during Year One of the Revolution. Shortly afterwards he settled in Spain in 1963, where he helped to create the experimental poetry movement of Spain in the sixties with Spanish friends Joan Brossa, Ignacio Gomez de Liaño, Herminio Molero and others. In 1967 he visited Belgium where he worked closely with the concrete poet Paul De Vree and co-edited his review, De Tafelronde in Antwerp; he also collaborated with the avant-garde magazines Phantomas and L’VII in Brussels. In Belgium he invented his first "Public Poems" - a way of "writing on the street like a page". He exhibited often in the avant-garde galleries of Belgium and in the Netherlands, which culminated in the big Concrete Poetry exhibition of the Stedelijk Museum of Amsterdam in 1972. During the same period he worked closely with the Lotta Poetica group in Italy, with scores of exhibitions throughout Europe (Documenta), Japan and South America. In 1975-76 he returned to New York for several years where he showed at the Emily Harvey Gallery and published several novels and critical articles on literature and the arts. In 1998 he returned to Europe in Venice and Paris, where he exhibits regularly at the Lara Vincy Galerie in Paris and various venues in Spain, Germany, Italy and Belgium. FONDAZIONE BONOTTO curates an installation setting, conceived in collaboration with Alain Arias-Misson specifically for the VENICE INTERNATIONAL PERFORMANCE ART WEEK 2014, which presents some of the historic Public Poems made by the Belgian-American visual poet. 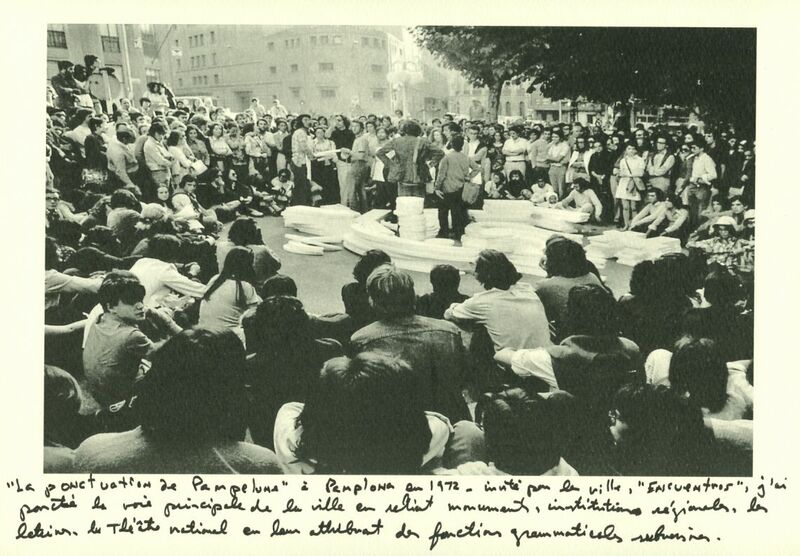 An extensive video documentation will allow the visitors to (re-)discover one of the most interesting poetic-performative experiences of the twentieth century, including the digital prints and videos of The Vietnam Public Poem (1967), The Punctuation Public Poem (1972) and The Teutonic Public Poem (1991). The Public Poems are a form of urban poetry invented by Arias-Misson and experimented for the first time in Belgium in 1967. Finding their ideal collocation in public spaces (especially in urban areas, characterized by a strong human presence: squares, subways, roads, etc...), the Public Poems tear the textual fabric of the city by using very specific elements from the street (the traffic, monuments, commercial and financial institutions, movements of people) as syntactic-semantic elements of an organic text that emerges simultaneously to the interruption of the text of the city. Curated by the artist and Fondazione Bonotto.